Hello everyone! Where has this week gone to? I wanted to play in this week's Stampin Sisters in Christ Challenge and so I had to put a move on this afternoon! I made this easel card for this week's challenge, which was based on Matt. 18:4 " Therefore, whoever humbles himself like this child is the greatest in the kingdom of heaven." The challenge was to use an image of a child or a sentiment about children, not a baby card. 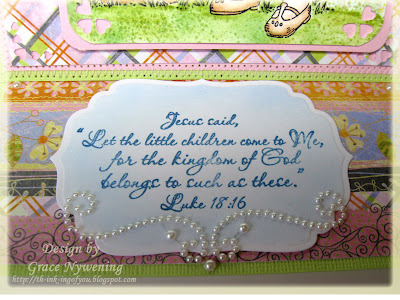 Well, Our Daily Bread designs has the perfect set for this challenge... it's called Children of God. It has several Scrpitures and sentiments that would be perfect. I chose this one from Matt. 18:6. I stamped the sentiment with Our Daily Bread designs Steel Blue Ink and cut with a Spellbinder's Label 4 die cut. While in the die I spritzed it with the airbrush, using Copic # B21. The image is a Penny Black large stamp that I stamped with Archival on Watercolor paper and watercolored with markers. I then masked the image and spritzed the bg with B21, B24, and N2. For the grass I used G20 and G24. I then dotted tiny dots with my SU! Markers, Old Olive and Pretty in Pink. The papers are: Base - Bazzill, Pink - Martha Stewart, DP - BasicGrey Sugar Rush. Accessories: May Arts Ribbon, Fiskars corner hearts punches, Sewing Machine, ZVA Creative Pearl Flourishes, Stickles for flower centers. I used the Bow Easy to make this bow... so fun! Oh Grace!! This is absolutely charming!! And your coloring is beautiful as usual!! Love this darling sweet card! Oh, I think I see a new stamp that I love...this little image is the sweetest, and you have brought her to life in this incredibly detailed coloring! I am so glad you were able to get this one done in time, we are all blessed to see it, Grace!! wow...beautiful work! This is just absolutely gor-geous!!! Thanks for playing along with us at Practical Scrappers! This is just so pretty! I love that green ribbon and your bow is perfect. Love the coloring too. Glorious card! I'm so very glad you played with us this week at Practical Scrappers. 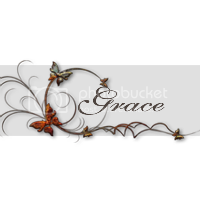 I'm so loving browsing about your blog! Ohhh what a beautiful card Grace,i love your image and colours. This is just darling Grace!!! I love it!!! What a sweet image!! Your coloring, design and sentiment are precious. The sentiment and the teeny tiny pearls qualify for the Sat. Spotlight. So glad you entered it my friend!! HOpe you are having a great weekend. TTYS! Great job Grace..Love this sweet image..Thanks for joining us at Saturday Spotlight this week. Absolutely gorgeous Grace! Everyone's doing these easel cards ... guess I need to give it a try. Thanks for the inspiration! Thanks so much for joining us at Saturday Spotlight. Hope to see you again next week!! Grace, this is beautiful my dear, love it! This precious, Grace! Wonderful message and coloring! Love the sweet image! Sweetly done, Grace! I love all the pattern and color variation. LOVELY! You've blessed us all with your thoughtful comments today, Grace, thank you! Oh Grace this is so lovely! Wow! That is a sweet image and such a nicely created confection of a card. 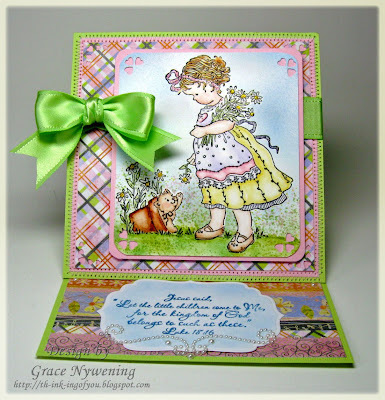 Thank you for participating in the Stampin' Sisters in Christ challenge this week! Absolutely beautiful!!!! gorgeous image! Thanks for sharing it with us at Saturday Spotlight this week! This is simple darling. That is the sweetest image, and your coloring is outstanding! Grace - I think you're thinking spring! I just love these colors, especially since they're 'taking' me away from the 28" of snow outside my window!